Weather woe, wind-assisted goals and super subs - just your average Saturday in the Football League. BBC Sport has picked out some things you may have missed from Saturday's action. The impact of Storm Desmond has been keenly felt in the north west of England in recent days. Thousands of homes and businesses in Cumbria and Lancashire have been severely affected by flooding, while Brunton Park - the home ground of League Two side Carlisle - was left under water. More torrential rain on Saturday caused disruption to the Football League's weekend fixture programme, with five games called off because of waterlogged pitches less than two hours before their scheduled 15:00 GMT kick-off. That's a combined 2,154 miles, the distance of a return trip from England to Algeria. May I refer you back to this very feature from 17 October and the tale of Stevenage goalkeeper Jesse Joronen? He scored from his own half in the League Two club's win over Wycombe that day. Not wishing to be outdone, defender Jerome Okimo did exactly the same on Saturday as Teddy Sheringham's side won 2-1 at AFC Wimbledon. 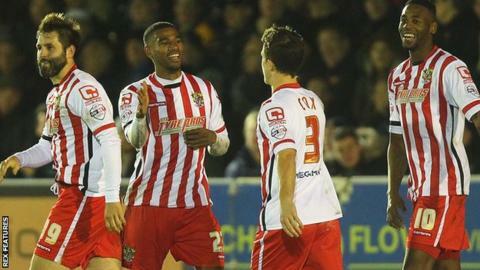 The 27-year-old's wind-assisted free-kick was Okimo's first ever Football League goal. "It was a little bit unfortunate on their behalf, how we got the second goal, but we felt it was coming from the possession we had and the pressure we put on them," Sheringham told BBC Three Counties Radio. "The goalkeeper [Ben Wilson] has made a real hash of it - he won't want to see it again. It was very fortuitous for us and we'll take it." Northampton Town have never been far from the headlines this season. The off-field uncertainty has been resolved following Kelvin Thomas' takeover, while on the pitch their players are delivering. The Cobblers were pegged back to 3-3 by Luton having led 3-1. Step forward, Ricky Holmes. Seconds after coming off the bench, Holmes picked up the ball and raced towards the Luton box before firing into the top corner. It proved to be the winner at Kenilworth Road, securing a seventh successive win in all competitions and sending Chris Wilder's side top of their division for the first time in 25 years. "Ricky's come on, got in a great position with his first touch and it was a fantastic finish," Wilder told BBC Radio Northampton. "From then on, I think we were pretty comfortable winners." Manchester United's shortage of goals has been well documented in recent weeks, and Saturday's Premier League defeat at Bournemouth will do little to ease the pressure on manager Louis van Gaal. James Wilson has been overlooked by United for much of the campaign, making only two appearances for the Red Devils before joining Brighton on loan in November. The 20-year-old striker has scored twice in his first three appearances for the Seagulls, including the opener in Saturday's 2-2 draw at fellow promotion hopefuls Derby. Championship leaders Brighton remain unbeaten this season after arguably their toughest fixture of the campaign so far, although they would have had all three points but for Chris Martin's late penalty. "They're two very good teams at this minute," manager Chris Hughton told BBC Sussex. "Having taken the lead twice, I don't think anyone would have begrudged us a win here, particularly being the away team. "Probably on the balance of play, it's a fair result." Burton Albion's remarkable progress continues. They are five points clear at the top of League One following Saturday's 3-0 win at fourth-placed Gillingham, which they achieved while their newly appointed manager was working as a television pundit overseas. In the absence of Nigel Clough, who has returned to Burton after almost seven years away to succeed Jimmy Floyd Hasselbaink as manager, coaches Gary Crosby and Andy Garner took charge of the Brewers - to fantastic effect. "I'm sure this will make Nigel's day a lot, lot better," Garner told BBC Radio Derby. "He spoke to Gary at half-time. Whatever he's doing, there's only one thing on his mind." Ex-Burton boss Jimmy Floyd Hasselbaink took charge of QPR for the first time on Saturday. Before his new side's 0-0 draw with Burnley, Hasselbaink was spotted enjoying a brew in the tunnel at Loftus Road.